What you see is all SG colors from opacity 100% in the middle down to 80/60/40/20 to left and right on black an white. At the top you see white, black and the themepackcolor grey (100% opacity) and it's inverse grey. Then the primary colors Red Green and Blue and beneath that their inverses 'Cyan', 'Magenta' and Yellow. Beneath that we have the standard blue and it's inverse brown. Note: you need themepacks for the Yellow and Robert Green and the Grey at the top. 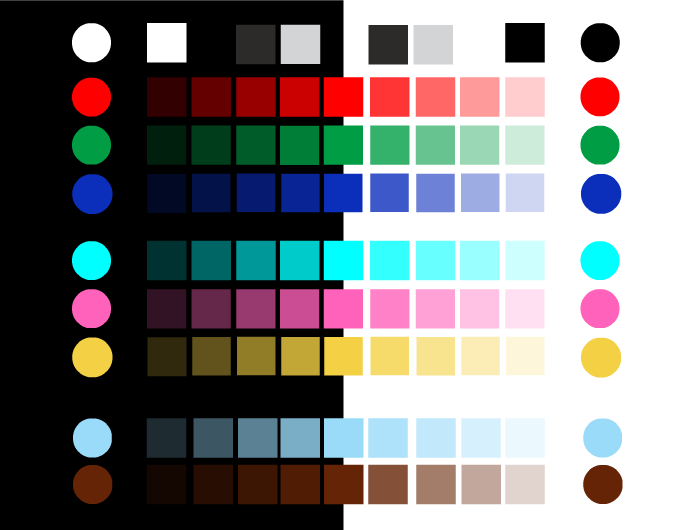 I made this as a standard paint box in my elements by making squares and circles from every possible pure color in SG (some are standard of course). The forms are made by MASKING for example a yellow christmassball with a square or circle. - This way I have got all pure colors and some opacities at hand. - I do not need to mask the christmassball everytime again. I just pick the Yellow ball for example, click 'unmask' throw the black circle used to mask away and take another form I want to mask, place that on the christmassball again and then 'mask' again. - The squares and circles are almost the same sizes (actually this is the most difficult part of achieving). True and very understandable. I often get mixed up in the layers too. But is see this as a starting point sometimes. @vogel: my problem is that I start very small and each "layer" become larger. So of the first "layer" is half the "working screen" is it a hell to work because you only mask the thing you need and that is not always a circle or a square. I think this stays the case also with this paint box. If I for example want to use yellow as a background, I pick the yellow square and stetch it way out of the drawing boundaries (so my sheet is totally covered). This becomes a massive object in fact. This is a standard element of mine.